Landing in the air port I was slightly dubious it was tiny and I had no clue which direction to head. We found an info point and they told us to get a taxi. We shared with some others and as we drove through the area I was worried we would hate it. 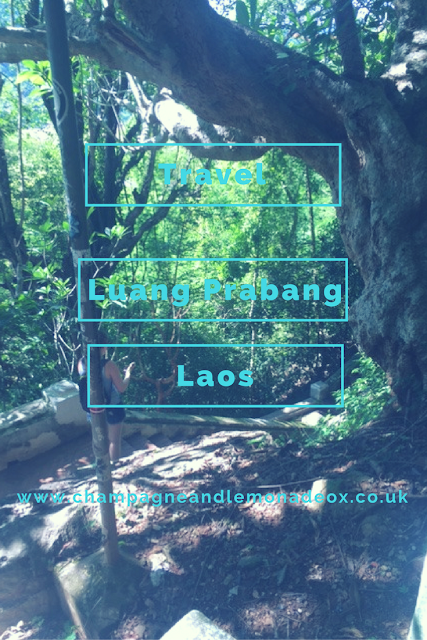 Laos is a very poor country so there really wasn't much around, I was beginning to think why are we here but we arrived at our hostel - which ended up being a botique hotel for £5 each per night for a huge room, double and a single bed, tv, fridge, wifi, en suite and breakfast ! The lady at the recption pointed us in the direction of the town and it was lovely. Really clean, lots of pretty buildings and everyone seemed really friendly. We spent our first evening having a look around and seeing what we could do with our time there. The was a beautiful market on the evening selling amazing hand crafted items - which I regret not buying however they would not be fitting in my backpack ! We did buy cute bracelets for 50p each and I found an adorable baby bib for my boyfriends sisters upcoming arrival :D there was clothes, jewellery, art everything all beautifully hand made. The next day we woke up early for breakfast in the hostel. We ordered a pancake each however this was litterally a cake made in a pan. It was very dry so we didn't eat it :( ! We found a local taxi (which is is like half tuk tuk, half van) to take us there and back to the water falls. This was about £12 for the hours journey there and back and he waited for us while we explored. We read reviews that said arrive early and avoid the crowds which we are pleased we did. It cost about £2 to enter the waterfall site and this included a visit to the small bear sanctuary too. It was worth the money 100%, it was a beautiful site and I even managed to have a little paddle in the water until a fish bit my leg and I ran out screaming! In the afternoon we wandered around the palace museum. This was around £2 entrance too. It wasn't anything amazing but was nice to say that we had looked round and seen how the royalty lived. We then walked up around 200 steps to the temple and look out point at the top of the town. The view was breath taking ! I recommend you take water though as it is steap. On the evening we ate street food in the market. We where given a bowl and we where able to fill it with all the food that was out on the table this cost us £1.50 each. This consisted of rice, noodles, veg, pasta fair etc. All veggie and you could add meat for another £1 I think. We sat on a shared table and ate with some other travellers. We then spent the rest of our evening at the Utopia bar. This was a outdoor area where everyone st on cushions and mat on the floor. There was other areas to sit too but as it was raining we had to b under the sheltered part. It was extremely chilled and really nice to just sit have a few drinks and relax. The next day we took a 5 hour bus to Vang Vien I think this cost us about £11 we where told it as a VIP bus with air con, toilet and comfy seats however it had no toilet or air con and I had a broken seat so we felt a little ripped off. This ticket did include a meal however! We stopped at a road side in the middle of nowhere and I opted for some form of meat and rice. It was disgusting so I didn't bother eating it :(. The view was amazing on the journey through the mountains, lovely green scenery and a few little villages that you could tell where very poor. Over all the journey wasn't too bad and I did manage to sleep for a hour or two. I really love Luang Prabang and I would 100% visit again. Even though the town was really small and there wasn't heaps to do I real loved how pretty it was. If you are planning on traveling to South East Asia I would recommend that you add in a stay in Laos.